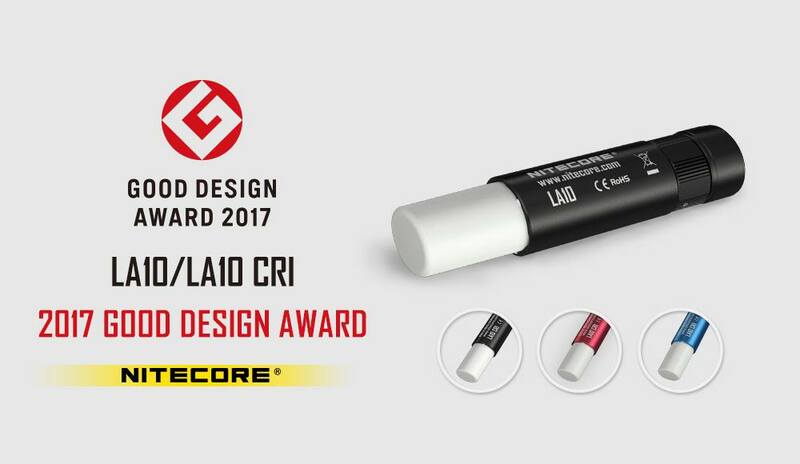 NITECORE has continued to blaze the trail in the aspect of exception designs for illumination tools and once again harvested the world’s most renowned design awards—the Good Design Award 2017! The Good Design Award is a comprehensive design-promotion system that picks good design out of a variety of unfolding phenomena, and aims to enrich our lives, industries, and society as a whole by highlighting and celebrating these works. The award was founded in 1957 and has been engaged in this work for about 60 years. Submissions come from a wide range of fields, and only 1200 designs are recognized every year. The NITECORE LA10/LA10 CRI was recognized for being “a pure lighting fixture with a single function, and the scenes to be applied are unlimited and depend on one's personal preference” and “its portability, skillful design, modesty and refinement, and surprising elements”. In fact, NITECORE has garnered several awards in the past like the iF Design Award, the Red Dot Design Award, the ISPO AWARD, the ISPO Gold Award and the Outdoor Industry Awards. And NITECORE’s illumination tools just once again shone brighter by getting recognized as winners of the Good Design Award.